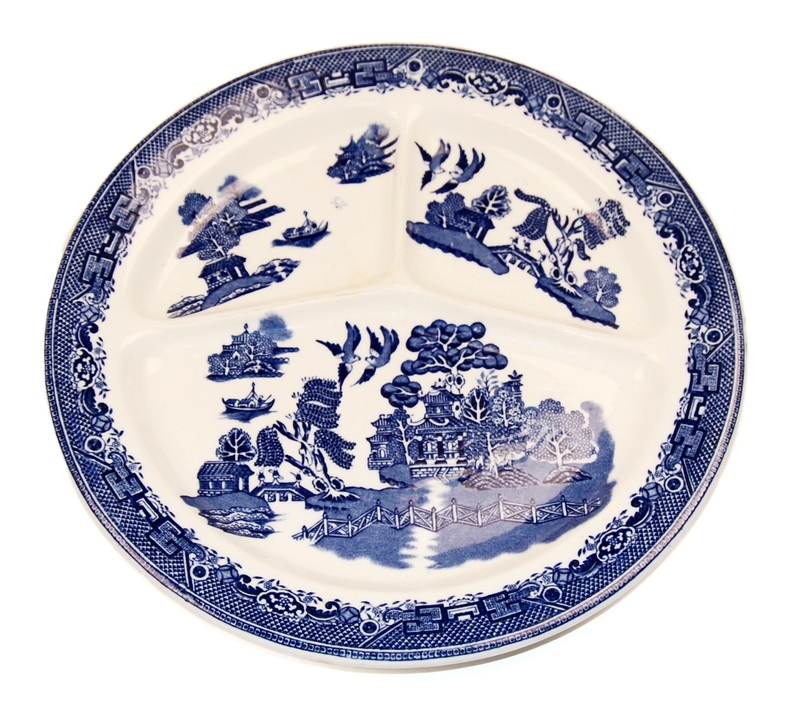 One of the most popular china collectibles of all time is the very old Blue Willow Pattern. This china pattern has been popular since pre-Victorian times and has been produced by a multitude of different manufacturers over the years from the "made in Japan" common china, to the delicate Nippon (essentially means Japan), and popular "Booth's" china. During the Pioneer era (roughly around the 1790s to the 1870s), Blue Willow was even found in the hotels, inns and roadstops that served food. 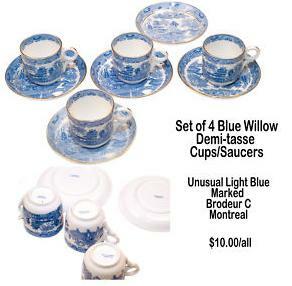 As late as the 1940s and early 1950s, Blue Willow restaurant ware could be found in some country eateries and diners. In fact, this pattern is so popular even today, that manufacturers such as Churchill are producing modern-day dinnerware sets using the same pattern. 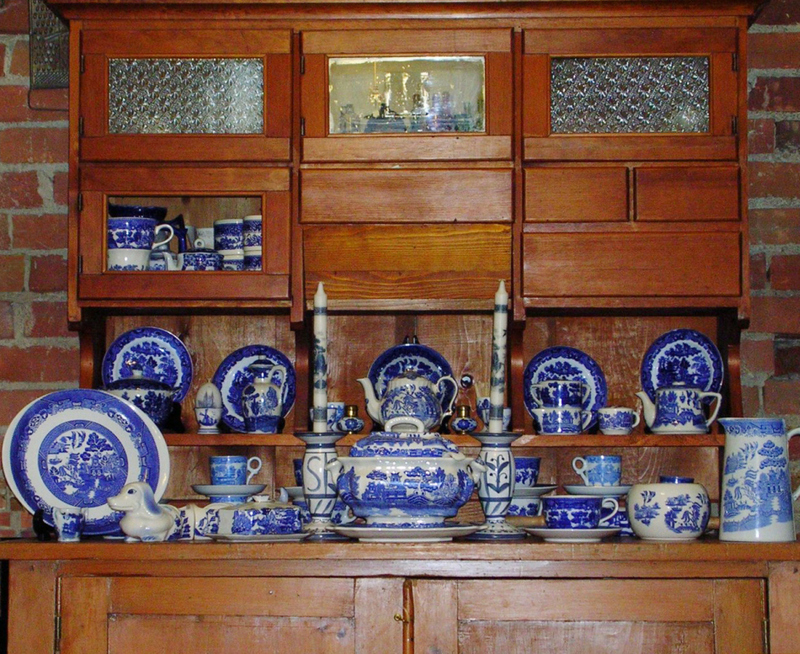 Variations of the patterns exist, and some collectors focus on one variation or another, while others will collect any pieces at all, so long as the Blue Willow pattern is present - and in some cases, it doesn't matter if the colour is actually blue. Rarer colours are pink, brown or black, and although these are less popular colours, they are rarer, and collectors of the pattern will buy them up in a hurry. On a personal level, what I liked about it was the blue, and less so the pattern as I have other blue and white ware too. The pattern appears not only on dinnerware like plates, bowls and cups but on other objects, like candlesticks (even candles), salt and pepper sets, egg cups, toasters, kettles, thimbles (more modern product), serving platters and candy dishes. In fact, I have a candy dish which (if I'm remembering the time period correctly) was a gift I had purchased for an aunt one year at Christmas when I was about 8 (making the year c.1968) and a wooden salad fork and spoon set with china handles and matching salt & pepper (bottom half wood, top half blue willow), imprinted with the blue willow pattern for my mother a couple of years later (c. 1971). Because it's still popular today, I'm wondering why I'm having such a tough time trying to sell some of my collection off. The prices I've set are pretty reasonable, since all of these pieces are vintage - I haven't purchased any Blue Willow pieces recently, and nothing I own was purchased "new" (reproductions). All of my pieces came from antique shops (which doesn't guarantee age so it pays to know a little something about collectible china) and estate sales, or have been inherited from family members. In fact, it was a family piece that started my "collecting" in the first place, shortly after I married. My grandmother had given my mother a lidded soup-tureen with matching ladle and rimmed plate, that my mom had always served our "Christmas" soup in. As kids, we always just thought of that soup as "Mom's Chicken-Meatball Soup", but came to understand as we grew up that it was Italian Wedding Soup. The only time my mother made that was on special holidays, like Christmas. 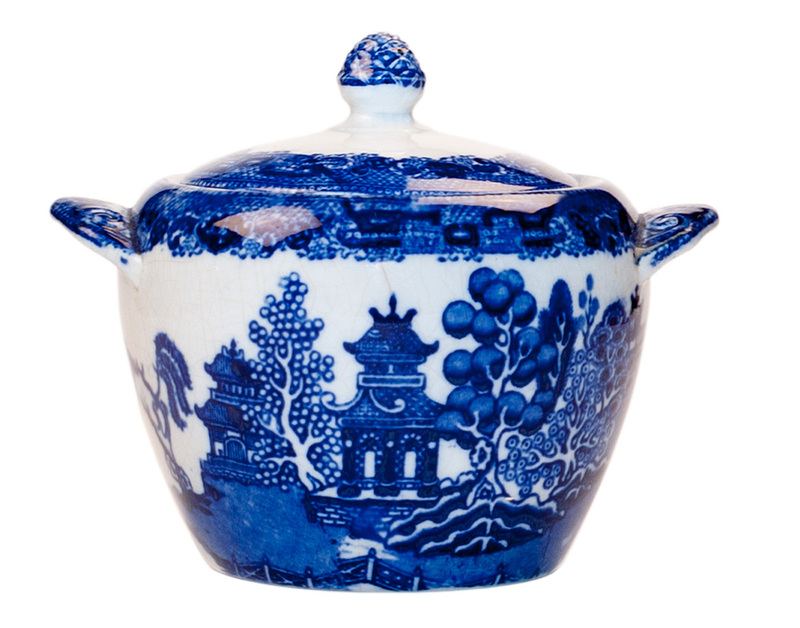 Anyway, not long after I got married, mom passed the tureen along to me, and that started my collection. 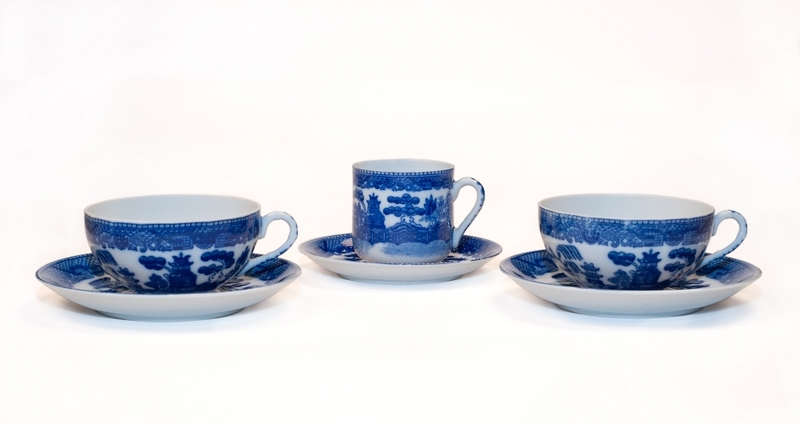 Had my mother not bought me a set of blue and white "good" china (a gorgeous pattern with scenes from Charles Dickens books on each piece, c. 1974) as part of my wedding gift, I probably wouldn't have gone on to collect any more blue and white. 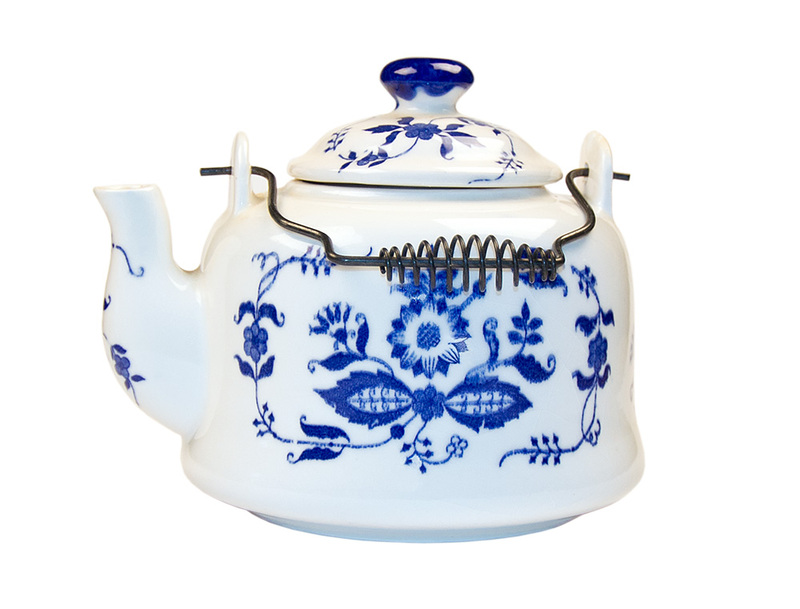 My aunt (my mom's sister) was already a huge lover of all things blue and white, but her collecting bug began with the Dutch Delft blue and white. 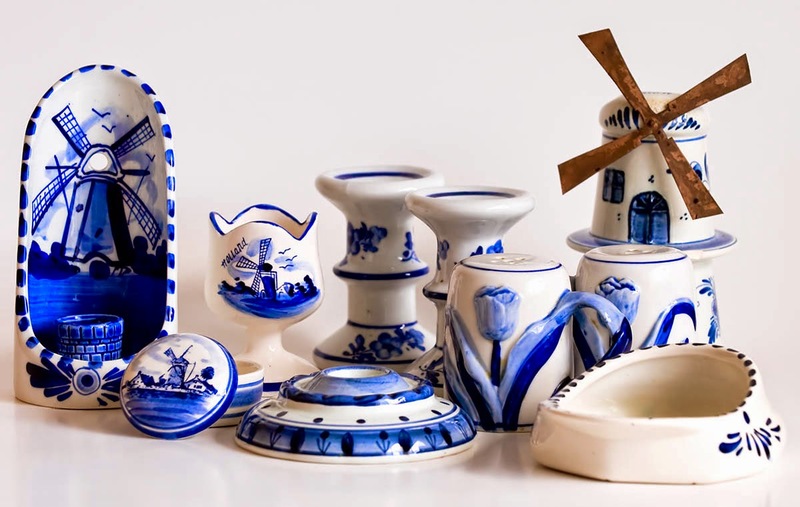 In her house in the city, her kitchen floor was tiled in very expensive imported blue and white Delft floor tiles, and she had many accessories with the familiar blue windmill from Holland. Most of her early pieces (1950s and 1960s) were ordered from a manufacturer in Holland, although a few were found in antique shops. The problem is 38 years later with grown kids and a smaller, down-sized home and (now) tiny kitchen and dining area, I haven't room to keep everything I've accumulated. I've kept my "wedding set", and Blue Willow pieces that have come from the family but need to part with much of the rest. If it hadn't been for the fact that my aunt (my mom's sister) passed along her complete china set to me (a Royal Doulton pattern called Millefleur, as well as all her other blue and white pieces), I'd probably have kept all the willow but sometimes one has to be a little practical. My aunt's china was what we ate off every year at Christmas from as far back as I can remember, so it evokes a lot of memories of my childhood, while the Blue Willow pieces I purchased myself are just "pretty china", with no emotional attachment. Still ... the cost of collecting it probably runs into a few thousand dollars. I don't really think of it as an investment, but I'd kind of like a few bucks for it ... just can't at this point figure out why I can't seem to sell it. I'm trying to sell it locally mostly (on Kijiji), because the shipping costs have been unreasonable, but I've noticed even going through some of the listings on e-bay ... nothing seems to be selling. Maybe it's just a summer-thing, I don't know, or maybe it's popularity has ebbed for the moment, but it seems unlikely. It's hard to say right now, but if I can't sell it (even for peanuts), I suppose I'll end up packing it all away in a big tote and try to find a way to store it, which I really would rather not do - after all, the whole point in selling it was to clear up some space in our house and storing the stuff isn't going to resolve that. UPDATE: After a year of trying to sell the individual pieces (in total, along with plates and accessories there were probably 50 to 60 pieces of blue willow, and several sets of Dutch collectors plates, small pieces, jugs and vases) I ended up offering it all "en masse" as it were to a local antique dealer for $100. Phew ... at least it isn't taking up space waiting for my kids to get rid of after I'm gone. It felt a little like a weight lifting off me. There is still some left, but not even a tenth of what I had. My girls don't really have any interest in old china, and neither of them wanted any of it. I would like to think someone in the family (if not my girls, one or both of my granddaughters, or my nieces) would at least hang onto the dog candy dish and the soup tureen, since those are the two pieces I have left with the most history (family-wise). It's hard to say what might happen in the future, and of course, when I'm gone ... I don't imagine I'll actually care what they do with the stuff that's left behind.